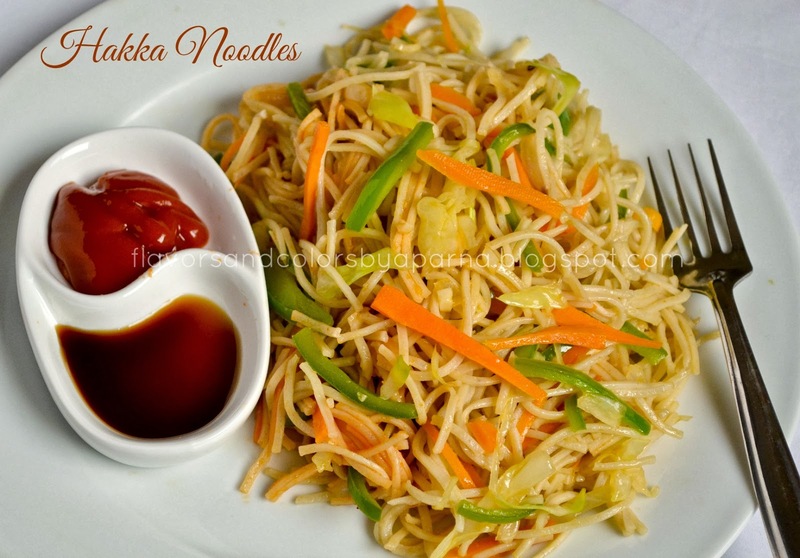 Hakka Noodles or Veg Chowmein is an Indian adaptation of hakka cuisine and very popular street food in India. These are thin noodles stir fried with garlic and tossed in chinese sauces that imparts the smoky flavors to this dish when served in restaurants. I tried many times to follow different tips and get closer to that flavor while making them at home but yet to match it restaurant style. Probably the wok which is used there for cooking as well as Chinese sauces used by chefs must be the reason to add that distinct flavor to this dish. Hopefully some day will try to get hold of it in my preparation, but till that time I am happy preparing it and making nutritious by adding lot and variety of vegetables. Cook noodles as per packet instructions. Drain them in a colander and rinse under cold water. Put a tbsp of oil on the noodles and mix well. This step prevents the noodles from sticking to each other. Keep them aside. Take a deep bottom pan/ wok. Heat olive oil. Add finely chopped garlic and saute it on high flame continuously for few seconds. Next add finely sliced onion and fry them till they turn translucent. Add chopped garlic, grated ginger and one slice green chilli. Fry lightly. Add all vegetables [ Here I have added cabbage, carrot, capsicum] and continue to toss them on high flame for a minute. Allow them to cook a little bit without losing their crunchiness. Next add soya sauce, vinegar, tomato ketchup [optional] and mix it all properly. 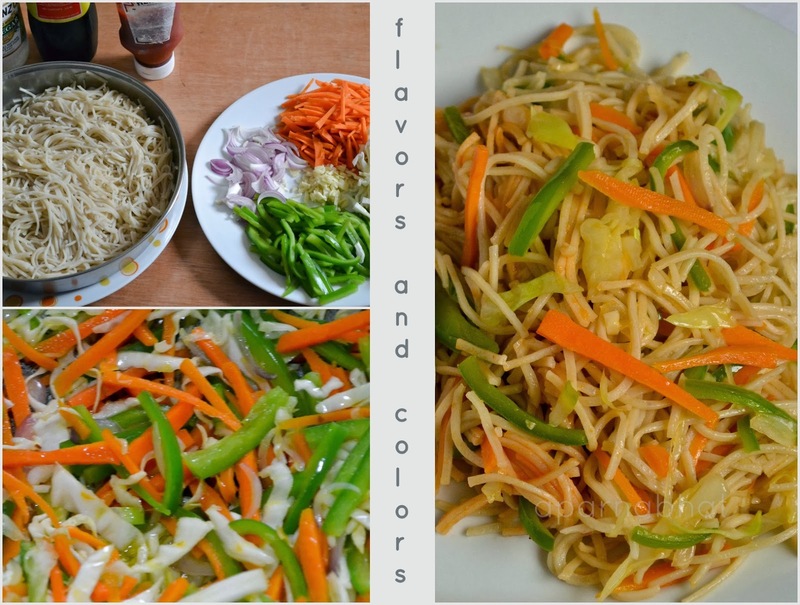 Just before serving, add cooked noodles and mix everything well so that noodles get coated with sauces. Adjust the sauces and salt as per taste. Cook it for 1-2 mins uncovered stirring gently and continuously. Switch off the flame and sprinkle some pepper powder. Garnish with finely chopped spring onion greens [I didn't have it here hence skipped it]. Serve it hot as it is or with chilli sauce [when served for adults]. While cooking noodles in Chinese way, it is said that cooking should be done on high flame with continuous stirring. thnku Smitha... I remember ur post equally tempting, lovely and colorful!